This farm is above all a paradise for lovers of quiet, the woods, the country as a way of life and sense of freedom. Roads, trails, forest paths branch off in a beautiful natural environment beautiful and wild, able to regenerate body and spirit, the man drawing closer to the rhythms of nature. The farmhouse is set in the context of a farm that stretches for about twenty acres of land bordering the dense forests of Monterufoli Nature Reserve, one of Tuscany’s most important for vegetation and extension. The five apartments of the farm will welcome guests in total harmony with the surrounding agricultural landscape in a suspended between ancient and modern, including a refined rustic Tuscan and the absolute comfort of environments reconstructed with care and attention to aesthetic environment. The welcome will be the usual one of the oldest farming families, warm and genuine vocation for spontaneous as any other knowledge of the land has been handed down from generation to generation. The owners live just a few hundred meters from the farm, ready to assist you with your every request. 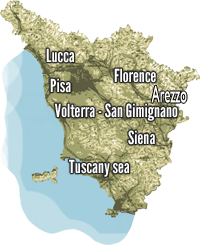 At 1 km from the farm, along a small dirt road, is a charming Tuscan village where you can enjoy a wonderful panoramic view over the Tuscan hills and the medieval town of Volterra. Inside the village there is a bar and a restaurant. Groceries, pharmacies, and services of all kinds are about 25 minutes by car. All the rooms have been renovated respecting and enhancing the rustic Tuscan style, with the restructuring have been used only original materials such as stone, brick, cedar wood, wrought iron. All apartments are equipped with: Kitchen with refrigerator with freezer, dishes, pots and kitchen utensils, toaster, Italian and American coffee maker, satellite TV, wireless Internet access is possible via cable, linen room, bathroom towels, heating. Outdoors: outdoor space, gazebo or porch shade, table and chairs, a grill, shaded parking for free. P1087-5: apartment TRILOCALE (5 people +2)80mq living room with kitchen with oven, dish-washing, sofa bed, fireplace, TV sat, double bedrooms, twin bedroom, single bedroom (or bunk bed ), 2 bathrooms with shower.